Researchers used hourly temperature maps and other data produced by the North American Land Data Assimilation System (NLDAS)—a land-surface modeling effort maintained by NASA and other organizations—along with physiological data to investigate how rates of evaporative water loss in response to high temperatures varied among five bird species with differing body masses. 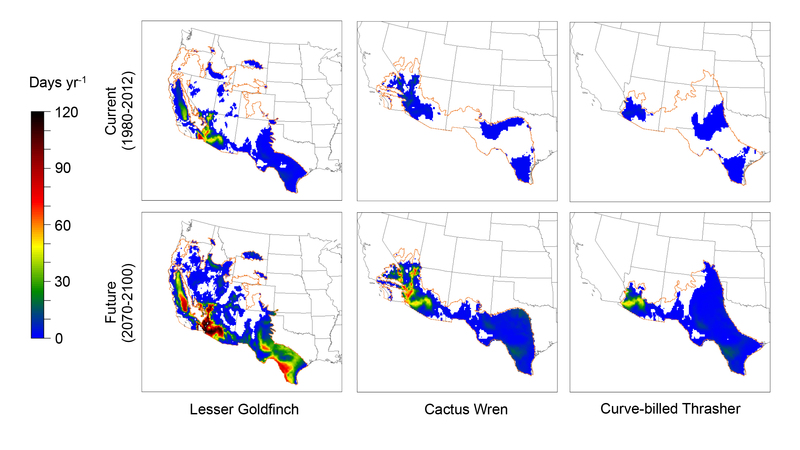 Using this data, they were able to map the potential effects of current and future heat waves on lethal dehydration risk for songbirds in the Southwest and how rapidly dehydration can occur in each species. Days per year with modeled lethal dehydration risk for three songbird species under our current climate from 1980 to 2012 and under a 7 degrees Fahrenheit future warming scenario from 2070 to 2100. Species are arranged in order of increasing body mass. Researchers homed in on five songbird species commonly found in the desert southwest: lesser goldfinch, house finch, cactus wren, Abert's towhee and the curve-billed thrasher. An image from NASA's Moderate Resolution Imaging Spectroradiometer showing hotter than normal daytime land surface temperatures over much of the Southwest United States July 1-8, 2001. A goldfinch sits on a branch. 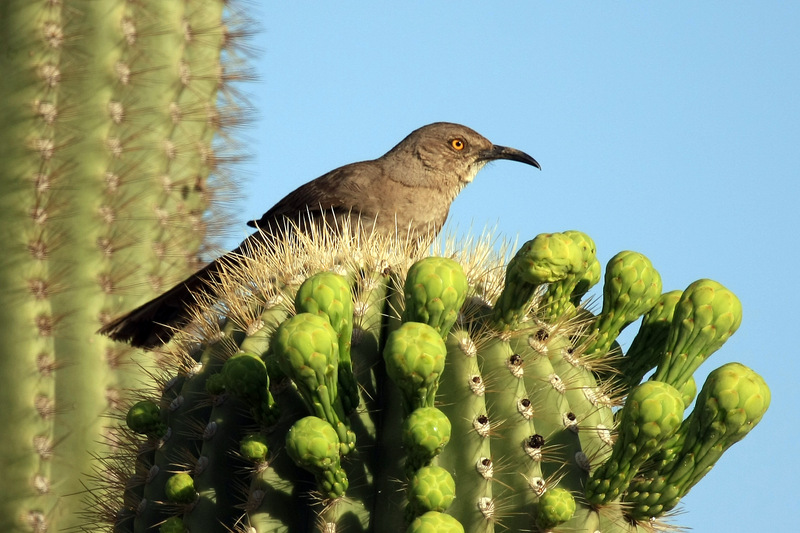 A Texas curve-bill thrasher sits on a cactus. 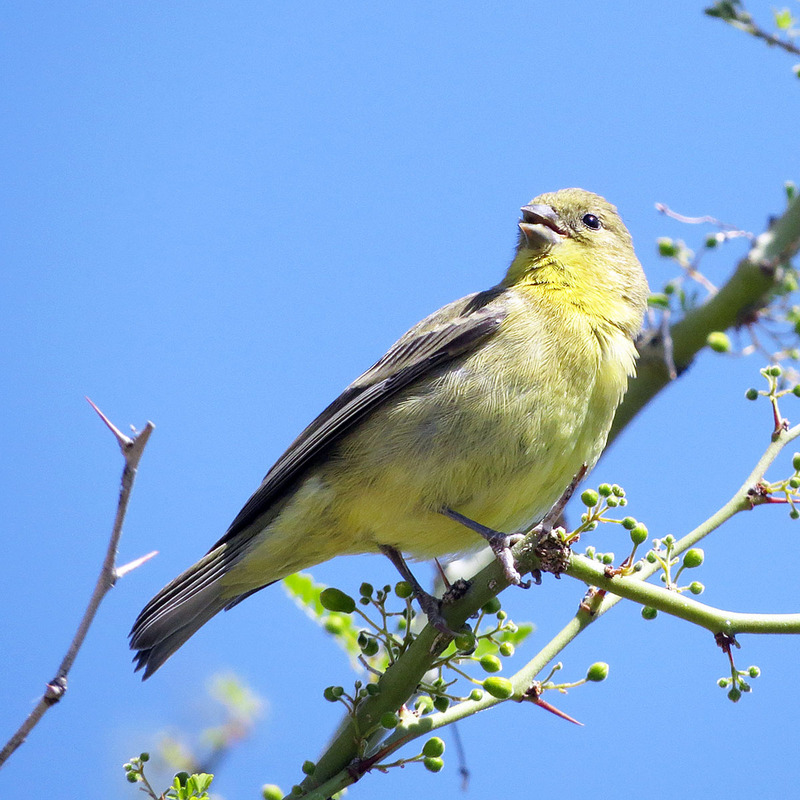 According to the researchers, given this warming scenario, climate refugia—microclimates such as mountaintops, trees and washes with shade that allow songbird body temperatures to cool to safe levels—might prove very important in management plans for certain vulnerable species. “Using this type of data, managers identifying the best refugia can have a better idea of the temperature profile that will be suitable for these birds,” Gerson said. This research is part of a global effort among researchers from the US, South Africa and Australia to more thoroughly understand the physiological responses of birds to increasing temperatures, with the goal of broadening our understanding of how rising temperatures will affect individuals, populations, and community structure. A three-year, $350,000 NASA New Investigator award also funded University of Nevada, Reno-based modeling aspects of this research.